Right now, over 100 million Americans secretly feel frustrated and bored with their lives. If you've come to regard yourself as your own worst enemy; if you constantly daydream and wonder, "Is this all there is? "; if you have a tendency, when asked how you're doing, to just say "Fine," you may be one of them. If this sounds familiar, there's clearly something missing from your life. This book will help you discover what it is, and how to win it back. Written by Mel Robbins, one of America's top relationship experts, this hands-on guide not only shows you how to put your finger on the problem, it reveals what to do about it.Mel Robbins has spent her career teaching people how to push past their self-imposed limits to get what they truly desire. She has an in-depth understanding of the psychological and social factors that repeatedly hold you back, and more importantly, a unique set of tools for getting you where you want to be. 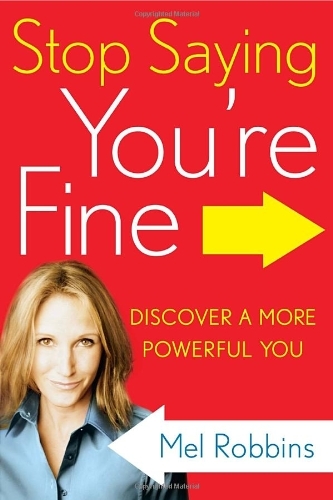 In Stop Saying You're Fine, she draws on the latest neuroscientific research, interviews with countless everyday people, and ideas she's tested in her own life to show what works and what doesn't. The key, she explains, is understanding how your own brain works against you. Because evolution has biased your mental gears against taking action, what you need are techniques to outsmart yourself.That may sound impossible, but Mel has created a remarkably effective method to help you do just that-and some of her discoveries will astonish you. By ignoring how you feel and seizing small amounts of rich possibility-a process she calls "leaning in"-you can make tiny course corrections add up to huge change. Among this book's other topics: how everything can depend on not hitting the snooze button; the science of connecting with other people; what children can teach us about getting things done; and why five seconds is the maximum time you should wait before acting on a great idea.Blending warmth, humor, and unflinching honesty with up-to-the-minute science and hard-earned widom, Stop Saying You're Fine moves beyond the platitudes and easy fixes offered in many self-help books. Mel's insights will actually help vault you to a better life, ensuring that the next time someone asks how you're doing, you can truthfully answer, "Absolutely great." "Why is it so hard to do the things that we know will make us happier? 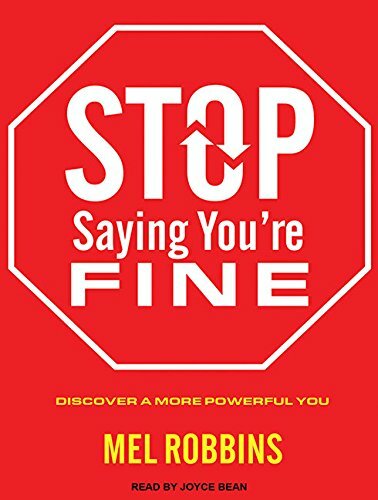 In Stop Saying You're Fine, Mel Robbins gives funny and sharp advice that's not only thought-provoking, but also action-provoking." "Mel Robbins is one of the most entertaining and compelling voices today. Read at your own risk. Mel will obliterate your excuses and leave you inspired, empowered and on fire." "Mel Robbins has the guts to tell you why your brain is your biggest problem - but only if you listen to it. Here, she tells you how to power through and get what you want. I, for one, am listening." 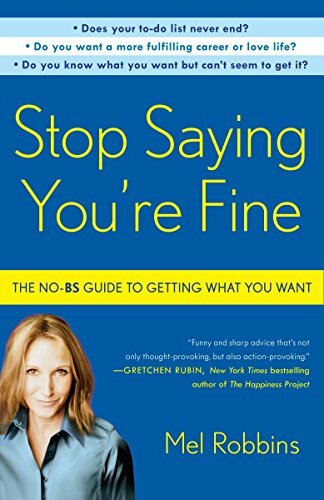 "In STOP SAYING YOU'RE FINE, Mel Robbins draws on everything from cutting-edge research to countless real-world case studies to create a wonderful program for anyone who's ever wanted to stop wishing and start doing." "Quit whining, stop saying you're fine, and just snap out of it. Easier said than done, of course, which is why this roadmap is so remarkable. It's jam-packed with concrete steps to pave the way." "STOP SAYING YOU'RE FINE nails a national problem: our tendency to try and be strong and stay the course--when it's the course we have to change, and strength is not working in our favor! In this no-nonsense book, every page demolishes the excuses we all make for not moving ahead with out lives, and gives us solid practical assignments that help us be better, happier, more fulfilled. Robbins is wonderfully inspiring and helpful, but also hugely entertaining -- moving forward doesn't have to be dull or depressing! You'll be surprised how her small suggestions can create life-changing new directions. STOP SAYING YOU'RE FINE deserves to be a best seller." Mel Robbins is a Dartmouth-educated lawyer-turned-life-coach and the host of the daily syndicated radio show "The Mel Robbins Show" and an upcoming relationship series on the A&E Network. Joyce Bean is an accomplished audiobook narrator and director. In addition to being an AudioFile Earphones Award winner, she has been nominated multiple times for a prestigious Audie Award, including for Good-bye and Amen by Beth Gutcheon.